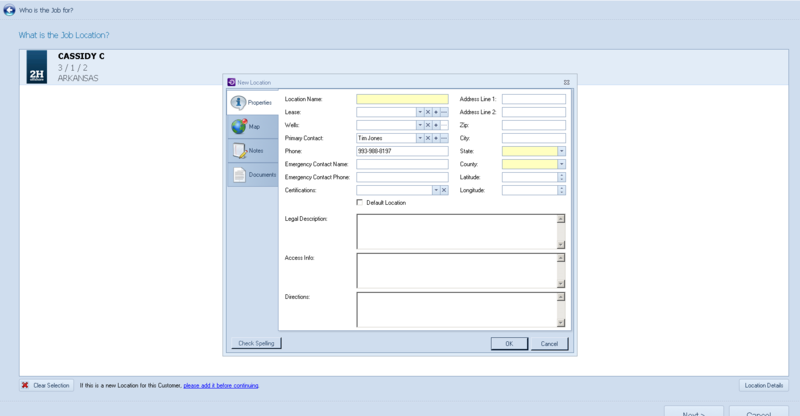 When working in OFS Field with a network connection, OFS automatically tries to synchronize with the server upon initialization and closure of the program. If you want to skip the initial synchronization, hold the Shift key while opening the program. Choose what type of Job is going to be performed. 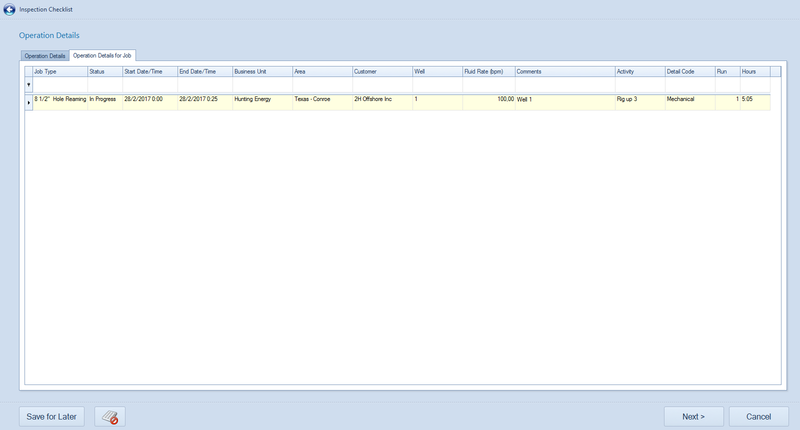 This window also allows for copying a previous Work Order or retrieving a Work Order saved to disk. Note: When a Work Order is copied, the supervisor is replaced with the current user. Enter the dates during which the job will be performed. The dates/times can be input manually or by using the arrows. Highlight AM/PM and use the arrow, arrow keys or scroll wheel to switch to PM/AM. Note: Right-clicking on the Back arrow at the top of the window will return to the previous window. Select the Work Order’s customer or add a new customer on this window. Choose the location where the job will be performed. Locations are set up and associated with the Customer. If applicable, choose the Customer Contact to which the Work Order is tied. If applicable, choose the job to which the Work Order is tied. Additional order information can be filled in in this window. 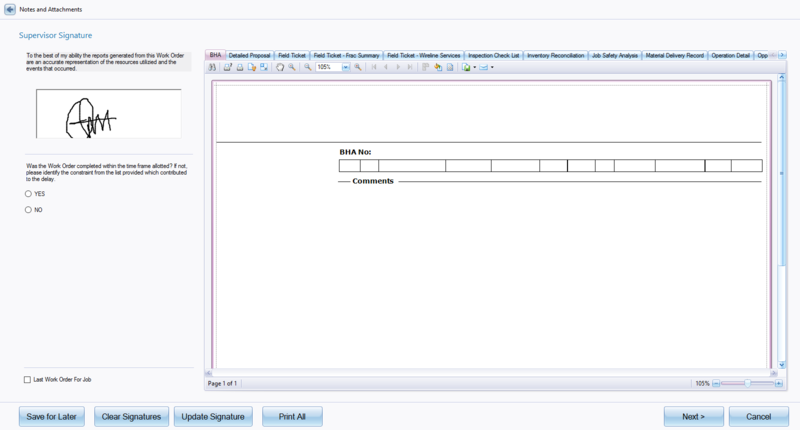 Again, the information displayed depends on the Job Type and the implemented customizations. Assign employees or work crews who will be working on the job. Note: From this point on, the Work Order can be saved for completion at a later time. Choose assets to be associated with the job. Add previously created asset groups and view asset details. The safety meeting window shows which employees have attended the meeting. Notes can be added to this page. The JSA checklist must be completed before the Work Order can be completed. This window shows the previously created Inspection Checklist. The checklist must be completed before the Work Order can be completed. This window contains a summary of the asset’s activities that occurred during the job. Operation details can be added, edited, duplicated and deleted. Input on-location, off-location, location hours and travel hours for employees assigned to the order. If “Default Employee and Asset Hours from Operations Details” has been checked on the Service Type, the employee hours will be overwritten by the hours from the Operation Details grid. Input operator, location and travel hours for assets assigned to the order. If “Default Employee and Asset Hours from Operations Details” has been checked on the Service Type, the asset hours will be overwritten by the hours from the Operation Details grid. Note: The “Equipment Usage Window” will only display when the “Asset Hours” tab is enabled in the Service Types module of the Customization menu. 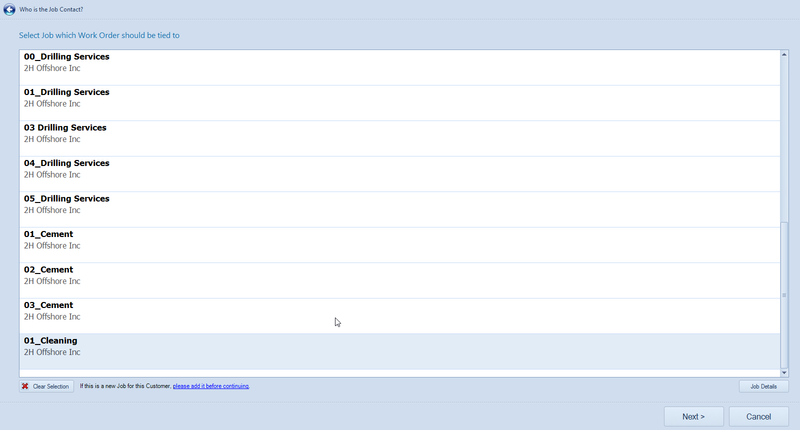 This tab enables adding, editing and deleting asset maintenance records. 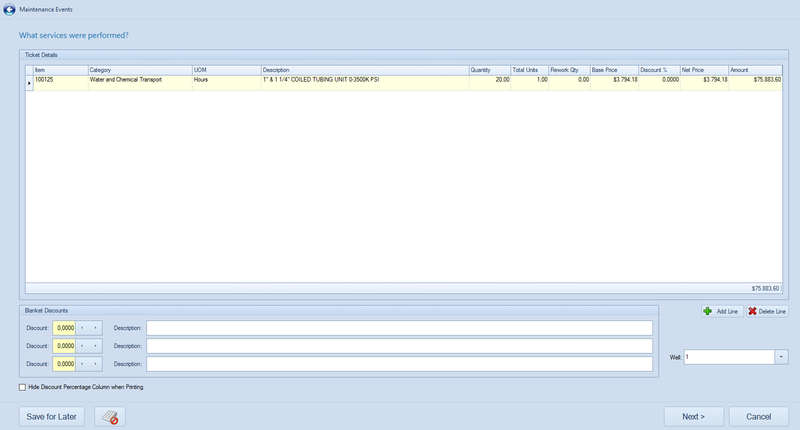 If there are no records, a warning “Are you sure there were no Asset Maintenance Issues on this Job?” will display. 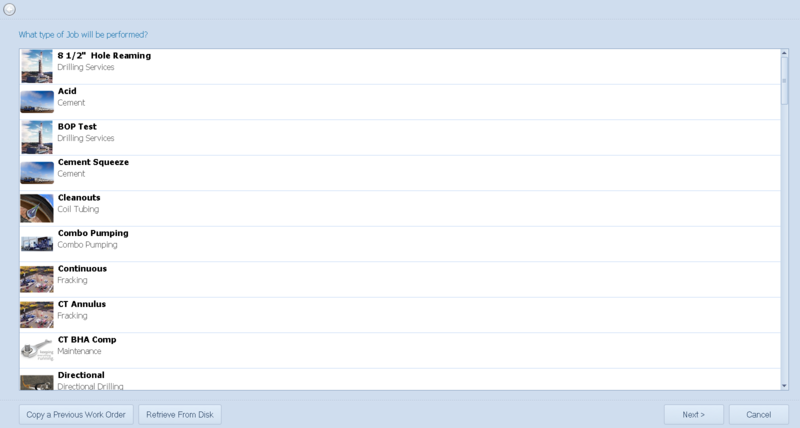 On the Services Performed tab, Field Ticket information can be added, edited and deleted. When a new Work Order is created, the Services Performed tab is filled in with items from the Job Type field ticket template (see Job Types for details) based on the Job Type chosen. The automatic price calculation for the Field Ticket is based on the Customer Pricing Contracts. 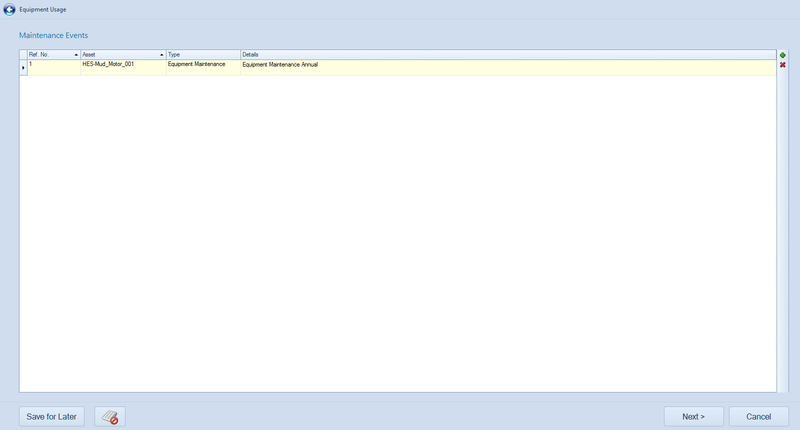 In case of an incident, Incident Reports can be added, edited and deleted on this tab. If there are no records, the warning “Are you sure there were no Incidents on this Job?” will display. This tab enables the inclusion of notes in plaintext, scanned copies of documents, and any other necessary files. For details on working within this tab, see “Notes“. 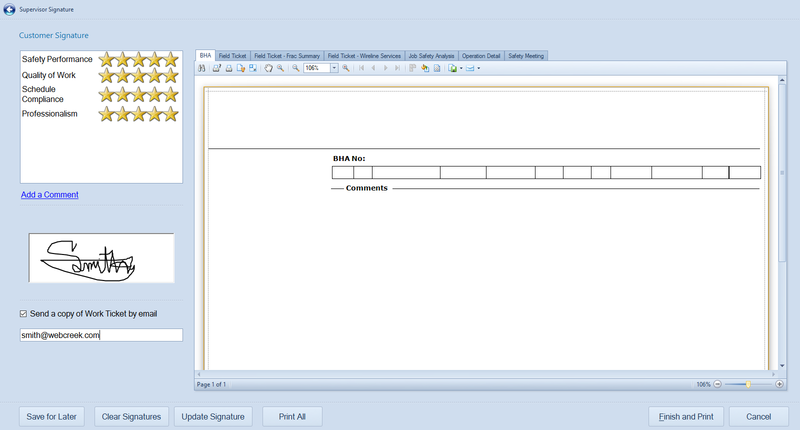 The Supervisor Signature window allows the job supervisor to view/print documents associated with the Work Order. If the Work Order is the final Work Order for a job, the supervisor will check the “Last Work Order for Job” box. The final step to completing the Work Order is obtaining the customer’s signature. 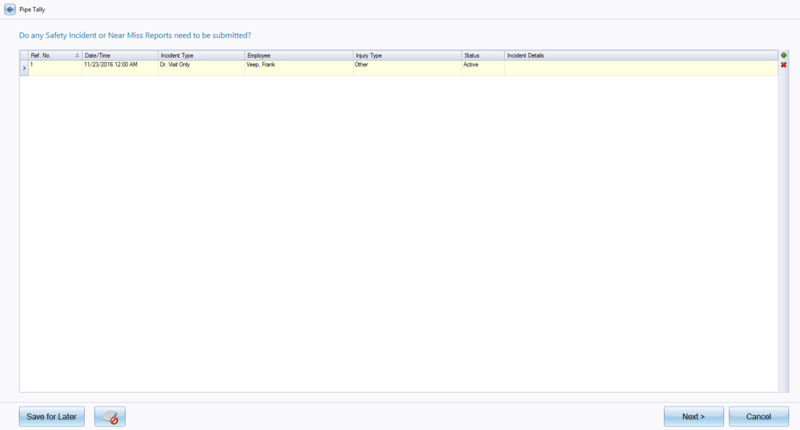 The customer can view/print selected documents, fill out the customer satisfaction survey and add comments. Note: Once the Work Order is completed or “Finished”, it will be placed in the Approvals list.